Kaza: His Holiness the Dalai Lama on Friday (10 July) emphasised the need to strengthen the study and preservation of Buddhism, which His Holiness said is survived in its complete form in Tibet and Himalayan regions. The people of Himalayan region should study Buddhism and make efforts to preserve this unique religion, His Holiness the Dalai Lama told thousands of devotees a day before a three-day preliminary Buddhist sermon at Kaza in Spiti valley. His Holiness gave preliminary teachings on text entitled “Shenpa She Dral gyi Damngyak” which was interpreted by Sakya Dakpa Gyaltsen upon the prophecy which Sakya Kunga Nyingpo (1092-1158) had received from Manjushree, the Buddha of compassion. The teaching was attended by many dignitaries like Phuntsok Rai, Raghuvir singh, former MLA, Zongsar Khen Rinpoche and member of Tibetan Parliament from Sakya school of Tibetan Buddhism, Abbots from Zongsar Institute, Sakya College and Sakya monastery and representatives from Ngor Gonpa and Sakya Phodang. People from Tabo, Dhankar, Kyibbar, Kyi, Pangmo, Hansa and Losar flocked here to attend the teaching and to have a glimpse of His Holiness. 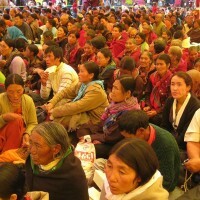 More than 15, 000 people gathered here for this three-day teaching at Kaza, which includes couple of hundred foreign devotees. Later in the evening, a seminar was held on Historical Contribution of Sakya Pandita on India-Tibet Religion and Culture, which was jointly organized by Sakya Tenggyu Monastery and Himalayan Buddhist Cultural Association, Delhi. Historians, writers and columnists joined from different interiors of Ladakh and Himachal Pradesh to debate present their views of Sakya Pandita and his role in the subject. The seminar was held within the teaching complex. Earlier on 9 July, His Holiness the Dalai Lama arrived at Kaza heliped for a five-day visit to Kaza, Tabo and Dangkar Monastery. On landing at the heliped, His Holiness was received by many eminent personalities and dignitaries like Khangsar Ngawang Khentse Tenzin Trinlay Rinpoche, Lochen Tulku, Serkong Rinpoche, Gyalong Rinpoche, Dr. Ramlal Markhanda MLA and Mr. Chhemed Bodh; Liaison Officer for Organizing Committee. Soon after his arrival, His Holiness inaugurated the newly constructed Khangsar Monastery. During the inaugural speech, His Holiness said, with the openings of such monastery the monks must now focus upon the enrichment of knowledge upon Buddha Dharma. More important than this, the opportunities of education and schooling must be given importance and only then, the development will take place in this area, His Holiness added. His Holiness also emphasized that it is important for the people of the Himalayan belt must engage themselves in organising seminars, debates and knowledge enriching opportunities so that they could truly realize the values of Buddhist values. Following the address by His Holiness, local artistes of Spiti and Kinnaur presented colourful cultural dances and songs. Coinciding with His Holiness the Dalai Lama’s visit to Kaza, the Tibet Museum organised a photo exhibition to commemorate “50 Years in Exile” in coordination with Himalayan Buddhist Cultural Association. In addition to express gratitude to the government and people of India, the three-day exhibition aims to enhance the cultural relationship between two Buddhist communities and promote awareness about Tibet. Earlier from 2 – 7 July, the Tibet Museum organised series of photo exhibitions at Nubra valley, Sakthi valley, Chemdre, Leh, Ladakh and Zangskar at the request of the Ladakh-based Himalayan Action for Peace in Tibet.